Hello there, it’s been a while since we talked. I just thought I’d drop a note to let you know what’s been happening on the writing front. I’m packing, and pulling my hair out while preparing for the Romance Writers of America’s annual conference. This year it is in Denver Colorado, so not only will I get to catch up with old friends, and meet new ones, I’ll get to visit another place I’ve never been before. I’ve been blessed to re-connect with a fabulous friend and co-worker from my days at Sun. Sherry’s retired now and between wrangling the farm, her grandkids and her husband she’s some how managed to find the time to wrangle me into order as well. She manages to talk me down from the ledge, make me laugh, or let me vent, almost every day now. I’d be lost without her ever calming presence. While spend most of my days throwing words at the wall hoping that they stick, the current book is coming along slowly. 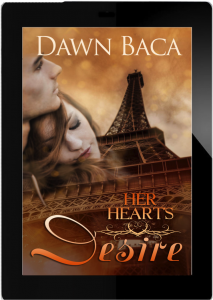 The next story in the Letting Love in Series is Her Heart’s Desire, a novella based on Sophie Compte, the French roommate from book 1. Take a look at the cover. The talented JN Sheets did it again. And the fantastic blurb came about with the help of Lisa Ricard. With these two ladies in my corner, I feel like I can do anything. A loving woman’s desire . . .
Sophie Compte leads a charmed life. Blessed with brains, beauty, and wealth she’s spent her whole life preparing to someday take the reins of the family business, a horse breeding farm world-renowned for its championship lineage. Also lucky in love, Sophie expects to marry the only boy ever to win her heart—if she can convince the man he’s become to bury his foolish pride. A strong man’s honor . . .
Claude Durand loves Sophie more than his next breath, but loving her and being worthy of her are two different things. He appreciates the long-term employment assured to him and his widowed mother by Sophie’s family, but he is determined to earn it for himself. For Claude, this means becoming an accomplished veterinarian so his value to the Compte business will never be questioned. He’ll marry Sophie because she owns his heart, but not until he’s proven to the world he’s the man she deserves. Threatened by scandal and pride . . . Turmoil erupts with the discovery of drugged horses on the Compte farm, and everyone is suspect. The lovers race to learn the truth before Sophie’s legacy is destroyed and Claude’s hard-earned reputation with it. Sophie is positive their love is strong enough to survive even the destruction of all they’ve worked for, but she fears Claude’s misplaced pride is stronger. She’ll do whatever it takes to convince him that win or lose, he is her heart’s desire. I hope to have Sophie’s story out by September at the latest. So keep an eye out for it. It is coming. In the meantime, my birthday is this week. So I’m doing something a little different. Instead of asking for gifts for myself, yeah who am I kidding, I did that too! 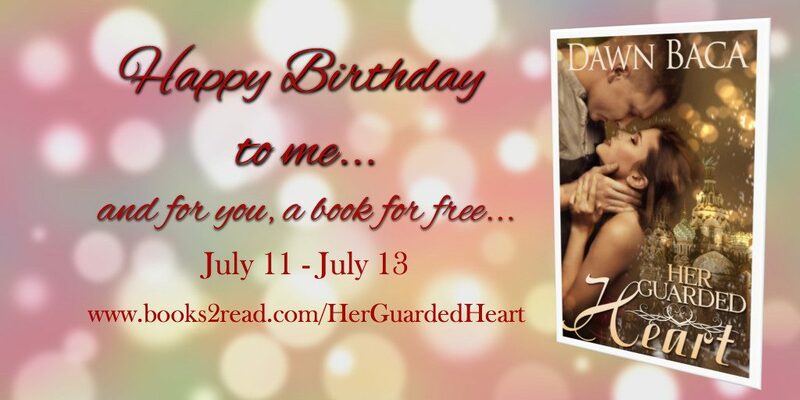 But seriously, I am offering up my first book Her Guarded Heart for FREE. Nope, not kidding. The E-Book will be available on all platforms for FREE today and tomorrow. So if you haven’t picked it up already grab it while you can, or if know someone who might be interested, please let them know. 3 Responses to "A Free Book"